Meebo has released it’s official app in the App Store. If you are not familiar with Meebo, it is a web based Instant Messaging client that allows you to connect to just about any IM service. Sticking to Meebo’s simple and sleek style, the iPhone app is just that… simple and sleek (and not to mention pretty quick!). Once you have signed in, you can quickly navigate through your buddy list. Chatting is easy and totally awesome with push notifications!! This video is a preview of the upcoming update to IM+. This application is $9.99 so I haven’t broken down and purchased it yet. But, as you can see in this video, the app is pretty sweet. One thing I noticed in the video is the app is sending your voice up to a server to transcribe it, like the Google App and Shazam do. The conversion doesn’t happen right on the iPhone. Either way, pretty sweet when you’re driving! There are quite a few mods in WinterBoard today and I want to mention a few…one of which I am excited to tell the ladies about!! I always try to post about any mods that are aimed toward us females, only because there are not a ton of them and so it is nice to know about the few there are. 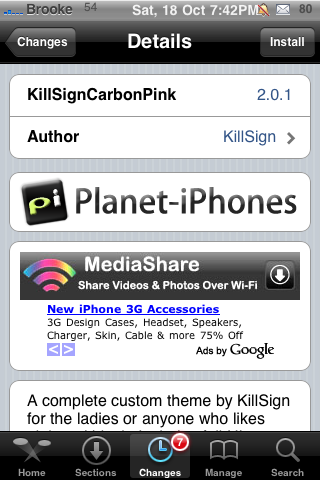 Well, I honestly have not found that I am overly impressed with but, I really like a new theme called KillSignCarbonPink the other mods are titled; Sun and Moon SMS, Icon Shadow and Icon Glow. There were are quite a few mods via Steffwiz’s Source in Cydia today. I thought I would touch on a few of them. I just had a person email me yesterday asking if I knew of any SMS bubbles that were available in Cydia and then today there were some! 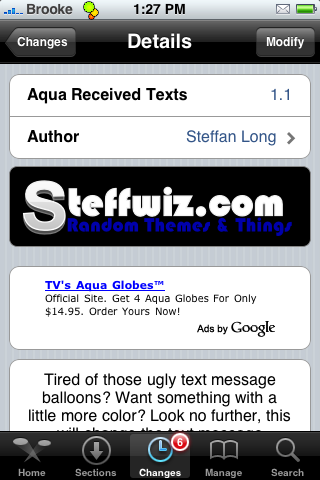 Steffwiz has released both Purple and Auqa SMS bubbles. 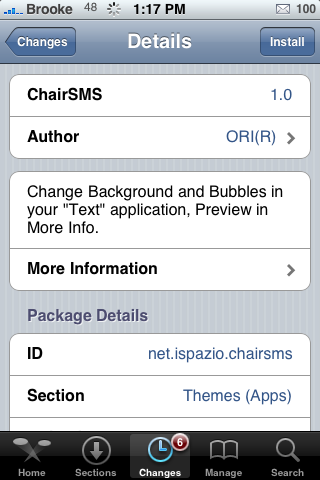 I know there are more than that in Cydia but, for the life of me I can’t remember the titles of the packages. If you know of any…let me know in the comments. This instant messanger application connects you to many services including AOL’s AIM, Google Talk, Yahoo! Messenger, Gadu Gadu, ICQ, Jabber, Apple’s iChat and Windows Live Messenger. Not only does it support text based chat, it also supports sending images and voice messages. It puts all of your online contacts together with their service’s icon next to their name. It’s pretty simple to use although I type pretty fast and the keyboard lagged just a bit and caused some spelling errors. The only change I notice with the update to version 1.0.20 of AgileMessenger is that there is now a Code Page option in the Preferences feature in the main menu. 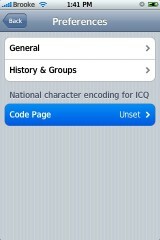 It allows you to change the national character encoding option for ICQ. 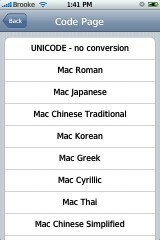 When selected, you will get a list of all the Code Page options. Let me know in the comments about any other changes you might see. 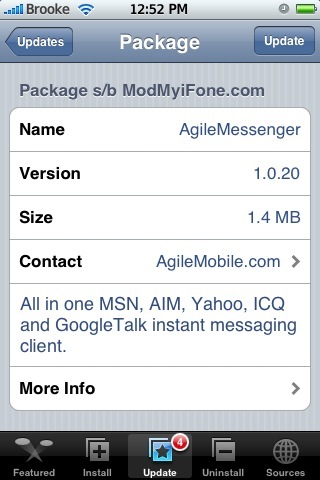 AgileMessenger is available through the ModMyiFone source. This is the mobile messaging application we’ve all been waiting for. 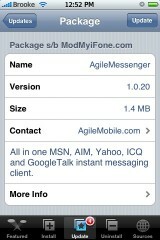 AgileMessenger is a multi service chat application that includes ICQ, MSN, AOL, Yahoo!, Jabber and GoogleTalk. This application is smooth, works over edge or wifi, has tons of features, runs in the background more. Yes, running in the background is going to effect your battery but this can be changed in the Preferences. The interface is great and the tab feature works great. My only complaint is the sound effects. The current sound is a little annoying and once a sound is made my audio becomes all muffled. It would be sweet if each service had their own original sound effect. I made a quick video to show you how great this really is. 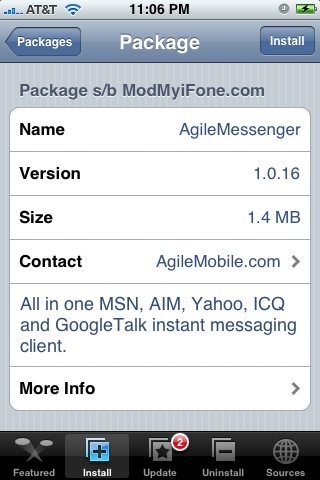 You can get AgileMessenger through the ModMyiFone source. Watch “AgileMessenger” on your iPhone or iPod Touch. Today is going to be crazy and we’re going to do everything we can to keep up. This post will stay at the top of our site most of the day. It will include a audio live stream from the conference (as long as it is available); links to all kinds of real info, and live chat. I will be updating our News Page with info so keep checking back. CrunchGear has posted some 3G iPhone pictures that include screenshots of video chat and a red version. 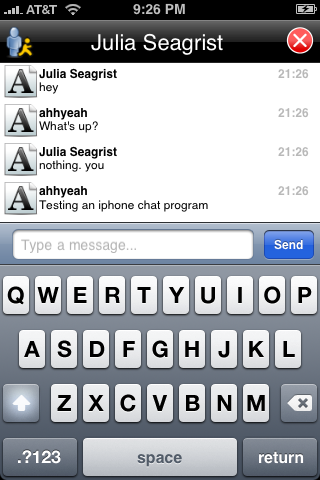 They also have screenshots of text that they believe proves iChat is coming to Windows. Hit their website for more photos and let us know in the comments what you think… real or fake? Just like the original version created for the iPhone, this is the same special pre-release R&D version with some chat bugs fixed so now you can mobile internet chat & interact in fring-style on your iPod touch (I know I am stating the obvious… but as there is no Microphone the iPod touch…. it means no fring calls as well). Doug and I also found that this version works a lot smoother for us. He was able to call Skype on my computer, I was able to call his iPhone from Skype on my computer and we were able to call from iPhone to iPhone using fring. Very, very cool! fring is vailable through the fring source. Below is a video of the developer using fring on an iPod Touch. Watch “fring for iPod Touch” on your iPhone or iPod Touch. We have added a live chat client to our website. You can visit by clicking “chat” at the top of the site or by visiting AppleiPhoneSchool.com/chat. Since this is new, we will be testing it for the next few weeks. We would love to hear your feedback in the comments. The rules are pretty simple, no swearing & keep the topic to the iPhone or iPod Touch. The chat can hold up to 50 users at once. If we need more, we can add it. We’re also planning on changing the avatars to iPhone icons and you’ll be able to choose.